It would be hard not to notice the recent craze for adult colouring pages - and of course we can understand exactly why it is a craze because we love colouring at Activity Village! Here you will find out latest "doodle" style colouring pages, offering some detailed backgrounds that are perfect for older children and grown-ups. There will be plenty more coming soon, so keep an eye on this page! This would make such a lovely, cheerful card to give to a special friend or family member this Christmas - made extra-special by being hand coloured in. 'Tis the season to be jolly - and colour! 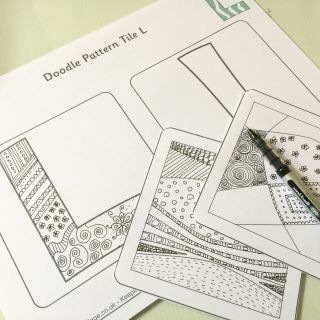 Doodle colouring pages are relaxing, lots of fun and enjoyed by kids and adults alike, and there's lots of detail to colour on this 2019 doodle page. It's a great way to pass some time waiting for midnight on New Year's Eve! We've got a set of six beautifully illustrated Day of the Dead Calaveras (sugar skulls) for you to print and colour in. Choose your favourites, or colour them all, then display as Day of the Dead decorations. Here's a lovely card to colour and give to someone special on Valentine's Day - or any day of the year, come to think of it! All you need is love ... and some colouring pens or pencils. All you need is love ... doo be doo be doo ... All you need is love, love, love is all you need ... And here's a colouring page to colour as you sing along! Colour this lovely card design - Always Do Your Best - and then fold in half ready to give to someone special. It is just one of our "colouring quote" cards. I was brought up with the words "Always Do Your Best" repeated often to me, and I've tried to pass them on to my kids too. This colouring page has been designed so tht it can be framed for display easily, and makes a great project for older children. This is the perfect colouring card to give to someone about to go off on their adventure of a lifetime, move to a new job, or perhaps move to a new town. We've designed it for older children (or adults) to colour in. Have you ever wanted to take off on a big adventure? This is the perfect colouring page to print and colour to inspire you. Perhaps you could frame it - or use it on the front of a planning folder for your next big holiday! Enjoy colouring in this beautiful illustration of Australia's national flower, the sweet-smelling Golden Wattle. This pretty autumn colouring card has one of our "colour pop" backgrounds and will really make your autumn leaves stand out, especially if you try using bright autumn colours such as red, orange and yellow. Autumn leaves come in so many beautiful colours, and this autumn doodle card is a little more detailed than some of our colouring cards so it's ideal for older kids. Here's a colouring page featuring the gorgeous national flower of The Bahamas, the Yellow Elder. Fun Fact: This beautiful evergreen shrub can grow up to 20 feet in height! Have fun colouring in this fabulous illustration of the Barbados national flower, the colourful 'Pride of Barbados'. Fun Fact: The Pride of Barbados appears on the Barbados coat of arms. Here's a lovely basket of Easter eggs for older children to colour in, in our "colour pop" style with background coloured in. There's lots of pretty detail to colour here! This gorgeous Easter colouring card for older children features a doodly picture of a basket filled with Easter eggs against a spring flower background. Just print (using your borderless settings for best results), fold, and colour. Here is a lovely doodly basket of Easter eggs colouring page which will keep older children busy for ages. There's lots of lovely detail to colour in on this one! Sometimes a friend, colleague or family member might need a reminder of how special they are. Encourage someone to "be bold, be brave, be you" with this lovely colouring card. Be bold, be brave, be you ... such a great reminder that everyone is individual, and everyone is special. Colour in this lovely colouring page and then frame it and put it on display to remind you! We designed this lovely colouring page with Thanksgiving in mind, but of course it is now known that being grateful - and thinking about gratitude or even writing down a list of things we are grateful for every day - can make a huge difference to happiness. This is such a lovely card to colour in and give to someone special this Christmas - with its message "Believe in the magic of Christmas" to charm them. This lovely colouring page - "Believe in the magic of Christmas" - has everything Christmassy to colour in! Tree, decorations, holly, stars ... it's all there. Why not add some glitter or silver and gold pens and frame the finished picture to display at Christmas? This BELIEVE word colouring page will hopefully give you a bit of inspiration whilst you colour in the word! Colour in the pretty national flower of Botswana, the Devil's Claw. If you enjoy this colouring page, why not try one of our other national flower colouring pages? This pretty colouring page featuring the simpur, the national flower of Brunei, will appeal to both kids and adults who enjoy colouring pages! Fun Fact: The usually large and stiff leaves are often used as food wrappers. This beautiful Buddha colouring card has lots of detail for children and adults alike to enjoy. What a lovely design to receive, too. The card works best when printed using your printer's borderless settings. This gorgeous "mindfulness" colouring page shows Buddha sitting in from of a stylised leaf from the bodhi tree, and is an intricate design that older children and adults will enjoy colouring in. You never know exactly what is coming your way - that's life! This is a great card for reminding a friend to sway with the wind and roll with the punches! When things don't go quite according to plan, the French shrug their shoulders and say "C'est la vie!" This lovely colouring page reminds us that we can't expect everything to go our way, but we can enjoy life nonetheless. We hope you'll enjoy this colouring page featuring the pretty national flower of Cameroon, the Red Stinkwood. Here's a lovely card to give to someone who might need a gentle reminder to "carpe diem" or "seize the day"! Carpe diem is the Latin translation for "seize the day" and of course it reminds us to make the most of every moment! This lovely cheerful cards reminds the giver to choose happy - and is sure to help them choose happy with its pretty design! Colouring in this cheerful colouring page is bound to help you "choose happy" - so it is a perfect one for keep ready for a gloomy afternoon or evening, perhaps! We have filled in the background on this lovely Christmas Angel colour pop colouring card, so that you can concentrate on colouring in the cute angel and the Christmas town below him. Print with your printer's borderless settings for best results. This little angel swings on the moon in the starry sky above a twinkling Christmas village – so pretty! We have coloured in the background, so that you can concentrate on the details. Print with your borderless settings for best results. This pretty Christmas angel colouring card is sure to delight whoever receives it – that's if you can bear to give it away when you've coloured it in! Print using your borderless settings for best results, and then simply fold your card in half. Here is a lovely "doodly Christmas colouring page featuring a pretty angel, swinging above a Christmas town. You could add in some golden stars and sprinkle some glitter on the roads of the buildings for a special touch! We've pre-coloured in some of the backgrounds on this fun set of Christmas colouring bookmarks. It makes your child's colouring "pop" out and can be a little less daunting for some kids! This is such a pretty colouring card design, we think it might be hard to part with this Christmas card when you have finished colouring it in! We pre--coloured background in a pale blue to set off whatever colours you choose to use. There our decorations and ribbons, dangles and chains and stars to colour in this pretty Christmas colour pop colouring page with pre-coloured background. Here is a doodle Christmas card for you to colour and give to someone special. Print (using your borderless settings for the best result) and then simply fold in half. Print out this lovely Christmas doodle colouring page. It's perfect for the kids and adults and has lots of detail to enjoy. Here are four lovely Christmas colouring bookmarks with all sorts of doodly details for the kids to get stuck into! Print out and slice up a batch for a classroom or party group - or just use them as a quiet activity at home. We've provided some "wallpaper" in the background of this pretty Christmas mantelpiece colour pop colouring card, just to make it a little different and to save you having to colour in too much of the background. Print using your borderless settings and then fold in half. Our "colour pop" version of this pretty Christmas mantelpiece colouring page has the wallpaper pre-coloured for you so that you can spend your time colouring in the lovely details! Colour in this pretty Christmas mantelpiece card, fold in half, and give it to someone very special this holiday season! Use your printer's borderless settings for the best result. Here is a gorgeous Christmas mantelpiece, complete with wreath, Christmas trees, and three pretty stockings – all ready for you to colour in. We have pre-coloured the background of this very pretty Christmas stocking "colour pop" colouring card, so that you can really enjoy colouring in the detail and making it pop on the page! I'm sure whoever receives this card will be absolutely thrilled. Here's a lovely Christmas stocking to colour in, with lots of detail to keep older kids busy. We've pre-coloured the background for you in our "colour pop" style. This Christmas stocking doodle colouring card has lots of detail to appeal to older kids and possibly adults too. Print using borderless settings if possible, colour and fold. This colouring page of a Christmas tree has lots of doodly detail to keep older kids (and possibly an adult or two) busy! We've pre-coloured the background to make the design pop. This rather modern Christmas tree design is full of doodly details to colour in! Whoever receives the card is sure to appreciate it! Use your printer's borderless settings for best results. Print out and colour in this delightful scene from a Christmas woods, then fold for a very special Christmas card! This lovely Christmas woods colouring page has lots of detail for older children to enjoy. This pretty colouring page is perfect for creative older children and adults! We've left a border around the edge for framing, too. The national flower of Cyprus, the beautiful and delicate Cyclamen, makes the perfect focal point for this colouring page. Fun Fact: Cyclamen is often used to make perfumes. Dare to dream - and give this lovely card, carefully coloured in, to someone special. Older children (and perhaps an adult or two) will enjoy colouring in this pretty design. I can imagine this colouring page coloured in restful blues and greens and pretty pastel colours .. but your dreams may be different! We've left a border around this colouring page so that you can frame it when coloured in if you wish. This Day of the Dead Calavera (sugar skull) colouring page will look fabulous coloured in with lots of bright and cheerful colours. You can choose any colours you like to colour in this fantastic Day of the Dead Calavera, but if you want to use more traditional Day of the Dead colours then try orange, red, purple, yellow, white and pink. Day of the Dead celebrations in Mexico are an explosion of colours, so grab your brightest pens and enjoy colouring in this beautifully detailed Calavera. This pretty (and slightly scary!) Day of the Dead Calavera colouring page has enough detail to appeal to both kids and adults, and you can display as a Day of the Dead decoration once you've finished, too. These fabulous Day of the Dead (Dia de los Muertos) colouring bookmarks have lots of intricate details, so they'll appeal to older kids and adults who enjoy colouring. Have fun colouring in this Day of the Dead skeleton character, complete with guitar and sombrero hat! Dia de los Muertos is the Spanish name for the colourful Mexican festival which honours the dead with lively festivities (known as Day of the Dead in English). Dominica's National flower, the Bwa Kwaib, has rich red flowers that are said to resemble the courage, strength and resilience of the Dominican people. We think it makes a lovely colouring page! We have filled this heart with lots of pretty doodles for you to colour in for Valentines day. Here is the second of eight doodle hearts to colour in. Choose traditional Valentines day colours or try something different! Flour, stars, stripes, dots… There are all sorts of doodles in this lovely heart colouring page for Valentine's Day. Here is the fifth in our set of doodle heart colouring pages. Colour the whole set and cut them out for display - how pretty they will look! Colour in the swirls and designs of this doodle heart colouring page - just one of our set of 8. There's a funny little face peaking into this doodle heart colouring page, which might appeal to the kids! There is a bow on this doodle heart colouring page - rather like a heart-shaped box of chocolates for Valentine's Day! This stunning Valentines card is sure to make an impact, especially when it has been coloured in carefully to make it really special. We've flood-filled the background of our doodle hearts colouring card with a pretty pink colour for Valentine's Day. Now you can concentrate on colouring in the detail! We have given this pretty hearts colouring page a background of pastel pink – perfect for Valentine's Day or any time you are feeling romantic! There are lots of pretty details on these doodle hearts for kids or adults to colour in – perfect for Valentine's Day, perhaps? This DREAM word colouring page might look nice coloured in and displayed on a bedroom wall, perhaps? Our "colour pop" colouring cards have the background filled in, so that you can concentrate on colouring the pretty details. And the details on this Easter chicks card are very pretty, with lots of flowers, eggs and doodly patterns to colour! We've filled in the background on this lovely "colour pop" Easter chicks colouring page, so that you can concentrate on all the pretty details and doodles! This lovely Easter colouring page is perfect for older kids - and possibly grown-ups too! There is so much detail to enjoy colouring in, including Easter eggs, chicks, daffodils and other spring flowers. Print this Easter cross colouring card onto white printer card, and simply fold in half before colouring in. What a special card to give this Easter! Our Easter cross colouring page is designed for older children, whio will enjoy the intricate details on the cross and the flowers in the background. Here's a lovely Easter doodle colouring page for older children (or maybe an adult or two!) featuring an Easter egg and the Easter bunny - and lots of intricate patterns for you to colour in. It is now well known and accepted that if we stop and pay attention to the little things - the things that might otherwsie get lost in our busy lives - we tend to be happier. This pretty card is a reminder of just that. This lovely colouring page can be enjoyed by older children (and adults) and is a wonderful reminder that we should pay attention to the little things - the moments we spend time colouring in, perhaps! Here is a lovely colouring card that reminds the receiver - and the person colouring it in - that "every moment matters". Carpe diem! Practice mindfulness as you colour in this lovely colouring page, which reminds you that "every moment matters" - just what mindfulness is all about! We've designed this colouring page for older children and adults to enjoy. This beautiful colouring card is perfect to send for lots of family occasions, and family members will be delighted that you've coloured it in just for them! Colour in the fireworks display on this lovely colouring page. We've done the background for you! This lovely colouring page of a fireworks display lighting up the sky has so much detail to colour in, making it perfect for older kids and also suitable for adults. When the colouring is done why not add a touch of glitter or some sequins for added sparkle! A home coloured card is something a bit special and this lovely fish doodle colour pop colouring card is sure to be well received. This detailed tropical fish doodle colouring card is sure to delight nature lovers, you can really let your imagination go with with the colours. You can enjoy going to town with bright colours for the tropical fish on this beautifly detailed fish doodle colouring page. Follow your heart when you colour in this lovely card - and follow your heart when you give it or send it, too! This makes a lovely colouring project for Valentine's Day, or any time. Print on borderless settings. Our "colouring quote" designs come with a wide border so tht you can frame them when done - and this one would look so pretty as a daily reminder to follow your heart! It would also make a lovely Valentine's Day project. What a lovely momento these would make of a special day. Our Fourth of July doodle colouring bookmarks will keep older children (and adults) busy for ages as they contain so much detail. This stunning colouring page features the Gambian national flower, the white variety orchid. We've left a gap around the edge so it's perfect for framing once completed. We've illustrated the beautiful hibiscus flowers of Ghana on this colouring page - perfect for a relaxing colouring experience! Fun Fact: Certain species of hibiscus are beginning to be used as a natural source of food colouring. Here's a lovely card to colour and give to a friend - perhaps one who always seems to bring the sunshine to your life! It would be a fun card to colour and give to a child, too. In these high-pressure times it is easy to forget that sometimes, good things take time. This pretty card is just the thing to colour and give to a friend who needs a little reminder - and who could fail to be cheered up by this one! Sometimes we might need a reminder that good things take time, and that's the message of this lovely colouring page. We've left a border so that you can frame it if you choose. The pretty bougainvillea is the national flower of Grenada and the star of this lovely colouring page! Fun Fact: It's not the flowers that make this plant so colourful, it's actually the magenta pink bracts (a leaf-like part of the plant). Here's a wonderfully detailed Happy 4th of July doodle colouring card for you to print and colour. Any recipient is sure to treasure this one. This fun doodle colouring page celebrates the 4th of July with flags and fireworks and much more. Older children will love the detail. This beautiful, detailed card is perfect for older kids and adults to colour in and send to someone to celebrate Earth Day. This pretty Happy Chanukah colouring card just prints out onto A4 card and folds in half. Use your borderless settings if possible. We've coloured in the background so that you can concentrate on the details. Our "colour pop" Happy Hanukkah colouring page has a pretty sky blue background already filled in so that you can simply colour in the details. Use your printer's borderless settings if possible. Wish friends and family a Happy Hanukkah with this pretty colouring card. They are sure to appreciate the effort. There are all sorts of pretty details on this lovely "Happy Hanukkah" colouring page, including a menorah, dreidel and oil lamp. Here's a lovely Happy New Year doodle colouring card that will keep older children (and adults) entertained and test colouring skills! Here's a pretty, doodle-style colouring page wishing a Happy New Year. Once coloured in, it would make a super poster for the wall ... you could even frame it and bring it out every year! There is lots of detail so the page is designed for older kids and adults. When life gets you down, sometimes you have to have the courage of your convictions and hold your head high! This is a lovely card to give to a friend who needs a little lift and encouragement. This is such a lovely design to colour and frame - as a reminder that there are times when you just need to hold your head high and keep on going! Here's a lovely colouring card to send to someone who has moved away for a while - perhaps to university or boarding school. It would also work very well as a "welcome to your new home" card. Colour this lovely "Home is where the heart is" colouring page, frame it and put it up on display somewhere in the heart of your home for all to see! This would be such a lovely colouring page to print out for older children (or adults) who are moving into a new home. We've left a border around the outside to make it easy to frame, and I think the finished page would look lovely hung in the kitchen on display. Sometimes the background to a colouring page can be a little daunting to colour in - so on this pretty hyacinth doodle colouring page, we've done it for you! It will take a little time to colour in this pretty hyacinth doodle colouring page - but that's the whole point! We've aimed it at older children (and adults - we know how many grown-ups enjoy a little bit of colouring in). There are lots of occasions when you might want to give someone this pretty colouring card - before an exam, sporting competition or starting a new school, college or job? Print onto some card (using the borderless setting on your printer for best results), colour, then fold. Here's a colouring page with a positive message - I can and I will - that's perfect for encouraging anyone to keep going and succeed (including yourself of course!). Colour in all the pretty details on our "colour pop" I Love You card and give it to someone special. Just print onto good paper or white card, then fold. Because sometimes colouring in the background of a colouring page can be a bit daunting - we've done it for you! There's still plenty to colour on this lovely detailed "I Love You" colouring page, and it will really "pop" against the background when you are done. The kids can say "I Love You" with this pretty colouring card. It's perfect for Mother's Day or Valentine's Day or any time you need a really special card for someone really special. Here's a new colouring page for older children (or grown-ups!) which would be perfect for Valentine's Day or Mother's Day, featuring the words "I Love You" as well as lots of pretty decorative elements to colour in. This beautiful colouring card is perfect for a flower-mad friend, or perhaps a fan of the Impressionist artist Monet. In fact, I think most people would be thrilled to receive it. Here is one of my favourite colouring quote pages so far! I must have flowers, always and always ... so said Monet. Colour the page in and frame to put it on display - lovely! Colour in this lovely "illuminated" letter A colouring card for someone special! We've got 2 versions, one with lots of detail for older kids and adults and one less embellished for younger children (or for children who would like to add their own embellishments). Create an elegant card featuring your friend or family member's initial by printing one of our illuminated letter colouring cards and colouring it in. We have two 'letter B' cards to choose from, a detailed version and simpler version that's ideal for younger kids. This illuminated letter b is ideal for displaying on its own or with our other alphabet colouring pages to create your own name display, perhaps for a child's room? Choose from a detailed, ornamental version, or a more basic design below. Here's another of our eye-catching illustrated letters of the alphabet, for the letter C. We have the whole alphabet to choose from, so you can easily make your own banners for special events and displays. Make any occasion extra special by colouring in and sending one of our beautiful illuminated letter cards. This letter D card might be great to give to Dad for his birthday or Father's Day - and we have two versions to choose from to suit different ages and abilities. Our illuminated letter colouring pages are designed to be framed easily, and would make a lovely gift once complete - perhaps to give to Dad for his birthday or Father's Day? Choose from a simple version that's ideal for younger kids, or try our intricately detailed version. This gorgeous illuminated letter E card is perfect to send any time of year, but if you use spring colours it might make a lovely Easter card? Choose from our detailed illustration or our more simple version below. Enjoy some relaxing colouring time with this eye-catching hand-illustrated Letter E colouring page. Choose from our ornate, detailed version or a simpler design below. This illuminated letter F colouring card would make a lovely, personalised card to give or receive - ideal for Father's Day perhaps? Choose from a simple version or a more detailed design below. We've got two versions of this beautiful illuminated letter F colouring page to choose from: simple (but still very pretty), or a very fancy version for those who enjoy highly detailed colouring pages. Create your own special greetings card by colouring in the beautifully illustrated letter G - you can choose from our detailed design, or add your own embellishments to the simpler one. Perfect to give to Grandma or Grandad perhaps? This beautiful illuminated letter G colouring page would be lovely to receive as a gift - perfect for a grandparent, or anyone who has a name beginning with G! Grab some fine markers or coloured pencils and add a burst of colour to this lovely letter I colouring card, then fold and give to someone for a special occasion - just decide if you'd prefer to colour the simple version or our more detailed design. No two of our illuminated letter colouring pages are exactly the same, but they all complement each other beautifully if you want to print and colour more than one to make a word or name. Choose from one of our two letter I pages: simple or embellished. Delight someone you know by colouring in this fabulous letter J colouring card and sending it to them - perfect if their name starts with a J! Greetings cards can be expensive, so why not print and colour one of our illuminated letter cards and create your own design? We have two designs to choose from for the letter K, simple (great for younger kids) and embellished (perfect for older children and adults). Our original, hand-drawn alphabet colouring pages are a great way to de-stress and you can frame your finished result too! We have two colouring pages for the letter K to download (simple and embellished). L is for Love, and we're sure whoever receives this fantastic letter L colouring card will love to receive it! We have a detailed version for those who love a colouring challenge, and a simplified version which is perfect for adding a few personal touches of your own. Our illuminated letter colouring pages have been designed for you to pick out individual letters, or you can use several together to make up a word that means something special to you. Love colouring? Share the love with this letter N illuminated colouring card! We have two versions for each letter of the alphabet (embellished and simple). Pick a letter from our illuminated letter alphabet and create your own work of art to display or give as a gift! This letter N has a slightly medieval feel to it, and might look good as a scrapbook cover? O is for ornate, just like the detailed design on this colouring card! We have a more simple version available to download too, perfect for younger kids. Colouring in our illuminated letters (like this letter O) can be a fun way to teach the alphabet to young children - just choose the simple design below. Adults and older kids will enjoy the challenge of our more detailed, ornate version! By colouring in this beautifully ornate letter P colouring card, you can create your own small, personalised piece of art to give to someone special! There are so many uses for these gorgeous illuminated letter colouring pages. Colour in this letter P, then use as a book cover, frame and display on a wall, or give to someone as a personalised gift. We have two styles to choose from below (simple, and a little more detailed). This stunning letter Q colouring card features beautiful feathers, possibly from a peacock - perhaps the inspiration for a colour scheme? Choose from our two versions below (simple and more detailed). This stunning letter Q colouring page has an eye-catching peacock feather design, so you might want to use some lovely rich colours to colour it in. Or you could choose the more simple outline letter below and add your own feathers and embellishments! If you have a loved one whose name begins with 'R', here's an easy way to make them a truly unique and personalised card! Simply choose which version of our card you prefer (simple or more detailed), print, colour in and fold. Large letter displays have been a huge trend in home decor over the past few years, and our beautiful illuminated letters will look great coloured in, framed and displayed on a wall. This page features the letter S, and we have two versions to choose from: detailed or more simple. Do you know someone whose name begins with the letter T? This might be the perfect card for them, and they are sure to appreciate the extra effort you've made (or the kids have made) to colour it in! Choose from 2 versions - one embellished and one simple. Here is a lovely "illuminated" letter T, almost Medieval in style, for the kids (or adults) to colour in. We have two versions - one embellished, one simple - to choose from. Our illuminated letter colouring pages, like this one for the letter U, have been inspired by nature and make a beautiful card for a loved one. This illuminated letter U colouring page has been illustrated with beautiful floral art and would look lovely displayed on its own or with some other letters to spell a word or name. This stunning letter V colouring card is beautifully illustrated and ready to personalise with a touch of colour! Choose from our two versions below (embellished or simple), print, then get colouring! Why not try colouring in and framing this illuminated letter V colouring page? Our illuminated letter pages look fantastic once completed, and make a great gift idea for birthdays and other special events. There's a more simple version available too, perfect for younger kids. Inspired by flora and fauna, this beautiful letter W colouring card would make a lovely personalised card to send to family and friends. Take some time and enjoy colouring in the embellished version, or choose the simpler design if you prefer. We have all 26 letters of the alphabet drawn in detailed doodles for you to colour in! This printable is for the letter W. Choose from our detailed and ornate version, or a more simplistic colouring page below. Why not try using unusual colours and different materials to make our colouring cards truly unique? We have two designs for the letter X to download, either simple or ornate/embellished. Colouring is a great way to reduce anxiety, relieve stress and to enjoy some free time. This fabulous letter X colouring page comes in two designs (simple or detailed) and incorporates a beautiful swan. This stunning letter Y colouring card is perfect for getting creative, and you can send your finished work to a friend or loved one. Choose from our simple or embellished designs, and there's enough blank space inside for a message, too. Colouring is a great way to relax, de-stress and have fun - and we've got colouring pages of the whole alphabet to choose from! There are two versions of our letter Y (simple and more intricate) to choose from below. This illuminated letter Z colouring card is perfect for all ages to decorate and send to family and friends - just choose the version you prefer (simple or embellished), then get colouring! Create your own beautiful artwork by colouring in this gorgeous illuminated letter Z. Our detailed version is perfect for adults and older kids who love colouring, and we've got a simpler version for the younger children to enjoy too. Grab some pens or coloured pencils and enjoy colouring in the beautiful national flower of India, the lotus. This lovely detailed colouring page echoes the types of design you see on beautiful roofs in the Islamic world. It will keep older children (and adults) very busy for a while! There are lots of intricate repeating pattern in this lovely Islamic-inspired colouring page aimed at older children (and adults). We've left a small border around the outside in case you want to frame your finished work. Our Jamaica national flower colouring page features the pretty Lignum Vitae. This plant is only found in Jamaica and has pretty purple/blue flowers. Just breathe - and colour! We all love "mindfulness" colouring pages because they force us to slow down and concentrate on what we are doing. This would be a lovely page for an older child to enjoy in the run up to exams, when they need a bit of breathing space. The stunning orchid is Kenya's unofficial national flower - and even if it's not officially the national flower yet, we think you'll enjoy colouring in this picture of one! Colour in this beautiful illustration of the Plumeria Frangipanis, which is considered to be the national flower of Kiribati. Fun Fact: Frangipanis won't burn except in extreme (over 500 degrees) temperatures. We're sure that whoever receives this pretty kites doodle colouring card will appreciate the effort that has gone into colouring all the lovely details! Colour in this lovely picture of a traditional koi carp design, perfect for your Japanese topic. When you are done, fold in half and give as a card which is sure to be appreciated. There is so much detail in this pretty Koi Carp colouring page, it is sure to keep all ages busy for a long time! Of course, Koi Carp designs like this are traditional in Asia, so this colouring page is perfect for your China or Japan topic work. This colouring page features a really interesting plant, the Aloe Polyphylla - the National flower of Lesotho. This card is perfect for creative people and gardeners! It would make a lovely card to give in spring - but might cheer up a winter's day, too. Just print (preferably with borderless settings), colour and fold. Here's a pretty colouring page full of flowers and creativity! Let your ideas bloom as you colour it in. We've left a big border around the edge of the colouring page so that you can frame the finished page. Print this pretty card and colour it in before folding and writing a message inside to someone special. It might be a good card to give someone who is recuperating from an illness, to remind them to take their time to get better rather than pushing themselves. Here is another of our "quote" colouring pages, designed for older children and adults. This one features the saying "Life's a journey, not a race" - a reminder to enjoy the day to day rather than rushing mindlessly towards the future. The Hibiscus rosa-sinensis is the national flower of Malaysia, and the pretty trumpet-shaped flowers of this lovely plant are ready to be coloured in on our gorgeous colouring page. We've got a beautiful illustration of the National Flower of Malta, the Maltese Centuary, for you to enjoy colouring in. This pretty flower is only found in Malta and was adopted as the national flower in the early 1970s. Here are another 8 beautiful mandala colouring pages, these with much more intricate designs so more appropriate for older children and adults. They come in one pdf file which you can download below. Here's a simple activity for Mardi Gras that will keep the kids busy for a while, and hopefully encourage a little reading! Print this page onto white card and cut out four Mardi Gras colouring bookmarks - two each of two designs. Enjoy colouring in the beautiful Trochetia Boutoniana (Boucle d'Oreille), the national flower of Mauritius. Fun Fact: Boucle d'oreille means earring in French! Here is a fun Christmas card project for the kids. Print out our Merry Christmas colour pop colouring card and fold it in half. You get the best results if you use your printer's borderless settings. Then simply colour in the letters so that they stand out from the pale green background. This is one of the most popular Christmas colouring pages at activity Village – but not everyone likes to leave the background right, or to colour it all in themselves. So, we've done it for you! For the best result, print with your borderless settings. Here's a pretty Christmas colouring page with a lovely Merry Christmas word design for the kids to print and colour. This colouring card is great to send to someone who needs a little encouragement to keep going and carry on - as the quote on the card says, "Mistakes are proof that I am trying", and it's always best to keep trying if we can! The sentiment behind this colouring page, which tells us "Mistakes are proof that I am trying", is a great message to teach children and just as important for adults too. We have all made mistakes, but we should always keep trying and not be afraid to keep going! This beautiful national flower colouring page for Mozambique features the stunning Maroon Bell Bean. Fun Fact: The leaves of the Maroon Bell Bean Tree are often enjoyed by local elephants! The Welwitschia (Namibia's national flower) might not be the prettiest flower to look at, but these plants are famous in Namibia and certainly make an interesting colouring page! The pretty Calophyllum is the star of this national flower colouring page for Nauru. Fun Fact: Traditionally Calophyllum wood was used to construct the keel of canoes by Pacific Islanders. Sometimes things don't go according to plan - but that doesn't mean we give up! This colouring card with a message - Never Give Up - might be appropriate for those times when someone you know needs a reminder to stay strong and keep going. This "never give up" colouring page has been designed with a white border so that you can frame the finished piece easily for display. It's a good reminder to keep going when times get tough, and is a lovely page for older children to colour in. Fun Fact: The Costus Spectabilis is often referred to as the Yellow Trumpet (it's easy to see why!). Sometimes on rainy days it can be hard to keep your mood up - so this "no rain, no flowers" card might be perfect to colour and give to someone who is feeling low. I remember as a child looking sadly out of the window on a rainy afternoon, trapped inside, and my grandmother saying to me, "Never mind, it's good for the garden". It didn't help much, to be honest! The fragrant Jasmine features on our national flower colouring page for Pakistan. Fun Fact: The Jasmine flower releases its fragrance after sunset, and is often strongest towards a full moon. Send friends and family a little Peace, Love and Joy this Christmas, with the help of this beautiful colouring card design. This peace, Love, Joy colouring page would be beautiful coloured and framed and on display in a Christmas kitchen, hallway or sitting room - a lovely way to remind us all of what is important during the festive season. Que sera, sera, Whatever will be, will be - so says the old song, and so says this pretty colouring card. I was brought up with Doris Day singing this song in the background - so I am looking forward to colouring this pretty Que Sera, Sera design and framing it for my office wall as a reminder that we can't entirely control our own future! This delightful rainforest colouring page has so much of interest to colour in, including all sorts of rainforest creatures when you look closely! Here is a "colour pop" version of our doodly rooster colouring card - by which I mean that we've pre-coloured the background for you in a bright orange, perfect for the Lunar New Year of the Rooster! There is so much lovely doodly detail to colour in on this rooster colouring page that we decided to do the background for you and make it into one of our "colour pop" pages. Enjoy this colouring page with a beautiful illustration of a red rose, the national flower of Rwanda. Fun Fact: The tallest rose bush ever recorded stood at 23 feet tall. Here's a pretty, detailed colouring page of Santa delivering presents - fun for some Christmas colouring in! There is a lot of work to go into this beautiful seahorse doodle colouring card, any one receiving one will be sure to treasure it. Here's a beautiful doodle colouring page featuring two pretty spring birds, which we think kids and adults can all enjoy colouring in. This would make a lovely card to colour for someone who has a birthday in spring, or perhaps a friend or family member who needs cheering up. When spring is in the air, it's hard to feel sad! Colour in these pretty roses, the national flower for Saint Lucia. Fun Fact: The rose was the winner of the Saint Lucia National Flower Competition in September 1985. The fascinating Soufriere Tree produces beautiful flowers, perfect for our St Vincent and the Grenadines national flower colouring page. Fun Facts: The Soufriere Tree was reported to have been collected on the volcano in 1804 before the volcano erupted in 1812. Wouldn't it be marvellous if we all started the day with a smile? Enjoy colouring in this card, then send to someone you know to make you both smile! This colouring page would be great to display at home, or in a classroom or workplace once finished, to remind everyone to start the day with a smile! This special colouring card features a beautiful flower bouquet on the front. Print onto white card and colour it carefully, before folding. Perfect for older kids - and maybe adults too. Here is a lovely doodle colouring page based around the word "Thankful" for your Thanksgiving colouring fun. With lots of detail it is perfect for older children or adults. Here's a beautiful colouring page bursting with flowers to be coloured in, and featuring the lovely quote "the earth laughs in flowers". The sky is the limit - so tell a friend or family member with this card, carefully coloured in! Perfect for older kids (or adults). Colour in this lovely colouring page with its hot air balloon floating off into a blue sky, and you really will know that the sky is the limit! We've left a border around the edge for framing. If someone is feeling a little gloomy, this card is perfect to cheer them up! Colour in the picture and remind someone that "the sun will come out tomorrow" - it always does, eventually! Colour in this lovely card for a friend who needs cheering up - or who just loves flowers! it's a perfect card for all year round. This lovely quote from Matisse is perfect for one of our colouring quote pages, and would look lovely framed on the wall for all the admire. This one is perfect for older kids and adults. It will definitely be easier to think happy thoughts when you are colouring in this lovely card - or receiving it! I know this is going to be on of the most popular of our colouring quotes cards. Families are so important in our lives, whether it's our relatives or a close group of friends or work colleagues that now feel like a family too! This lovely colouring page featuring the quote "Together we make a family" is perfect for displaying on a wall in your family home once you've coloured it in. Older visitors might recognise the quote "Tomorrow is another day" from Gone With The Wind, famously spoken by Scarlet O'Hara at the end of the book (and movie). There's a lot of detail to colour in on these doodle-style umbrellas, perfect if you're passing some time waiting for the rain to stop outside!! This pretty Valentine's Day colouring page is in "doodle" style and offers plenty of intricate details for older children (and grown ups) to colour in! This might be the perfect colouring card for someone special this Christmas! The minute the recipient opens it, they will humming this old-fashioned Christmas song and enjoying your Christmas greeting! Wish yourself a "very merry Christmas" by taking the time to enjoy this lovely Christmas colouring page. We've left a border around it for framing and I can imagine how pretty it would look hanging during the festive season in a simple frame. This colouring card would be a lovely design to give to a friend who always helps out, either personally or in the community, perhaps to say thank you. "We rise by lifting others". This might be a good colouring page for older children - especially if you frame it and put it on display, perhaps in the classroom, to remind children that helping their friends and classmates only helps them. Our lovely doodly wedding cake colouring page might have just a bit too much colouring involved for some, so we did the background for you! We think the pretty lilac colour really makes the design "pop". This lovely wedding cake colouring page has been designed for older children and adults to enjoy, with lots of lovely details to colour in - including the bride and groom on top of the cake! This wedding card is very pretty as it is, but it will be beautiful once coloured in - and sure to be appreciated by the happy couple. Use your printer's borderless settings for best results. Older kids and adults will enjoy colouring in this pretty, detailed card for a wedding couple, complete with an engagement ring, wedding ring and pretty bird. Print using borderless settings if possible, then simply fold in half. This is a really special colouring card, for a really special occasion - as you can see by the bride and groom on top of the wedding cake! It is best printed with borderless settings. This lovely, detailed and very pretty colouring page is themed for a wedding, or for true love! Perfect for older kids and adults to colour it, it also comes as a colouring card and a "colour pop" colouring page. Perhaps you have new neighbours moving into your village, or guests coming to stay for a while. Welcome them to your home with this pretty colouring card, designed for older kids and adults to enjoy. This is a perfect card to colour and give to someone who is having a hard time and needs a boost, and perhaps a reminder that there is always another way! I love this colouring page! There have been many times when nothing has gone right and I've just turned around and headed in another direction. This particular colouring page is framed and on my office wall, to remind me that there is always another direction to head in! Wherever you go, go with all your heart! My Granny used to tell me this, and I think it was good advice. If you know someone who has the travel bug, or is perhaps looking to make a move to a new job, house or town, this might be the perfect card for them. Here is another in our very popular set of "colouring quotes", this one with the message "Wherever you go, go with all your heart." We've left a border around it so that you can frame it and put it on display for inspiration when you've coloured it in. Sometimes colouring the background of one of our more detailed colouring pages can be a challenge - and that's why we've created our "colour pop" versions. Print and fold this pretty winter snowflakes card, and colour in the lovely detailed snowflakes. We've done the background for you! For someone special, print and colour this lovely winter scene, filled with snowflakes! Print onto card or good quality paper using your borderless settings for the best result; alternatively trim after printing and folding. You could add some sparkle with a dusting of glitter, too! This pretty colouring picture, filled with snowflakes and snow, could be coloured in pastel colours, silvers and greys. There is plenty of detail to keep older kids (and even adults) happy. This lovely colouring card features some simple but wise words - worry less, smile more! Print using the borderless settings on your printer for the best result. We hope that colouring in this lovely colouring page will help you to worry less and smile more! You are my sunshine, my only sunshine. You make me happy when skies are grey ... Cheer someone up with this pretty card, carefully coloured in and providing plenty of sunshine, whatever the weather! Print with borderless settings if you can. Bring a little sunshine into someone's life by printing out this cheerful "You Are My Sunshine" colouring page! It's perfect for older kids, and we've left a border around the edge in case you want to frame the finished picture.